A page-turner that combines pacy plot with intellect and a grand historical sweep. O'Neill's gift is to underpin his bold fancies with scholarship. [His] writing is both spry and forceful. The characters are vividly alive in their obsessions. 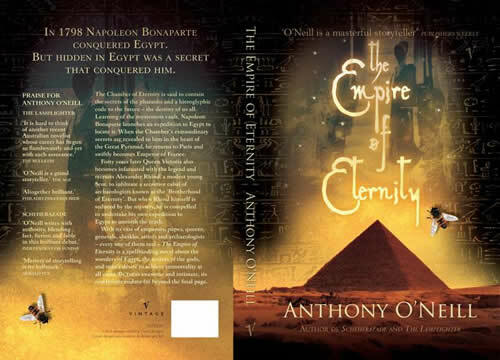 The Empire of Eternity establishes O'Neill's reputation as a suave, daring and unflaggingly entertaining story-teller. Napoleon, ancient curses and Victorian intrigue make for a gripping novel. What you get in O'Neill's novels is a vivid evocation of time and place, allied to an unflagging narrative drive. His language can be casually arresting. But his rarer quality is that his dramatic imagination is as strong as his sense of history. A tasty snack for the reader's imagination. O’Neill successfully interweaves two simultaneous narratives – Napoleon’s quest and Rhind’s investigations – which, surprisingly, meet in a climax that is shocking yet enlightening, and utterly satisfying. The subjects that have inspired Anthony O’Neill have never been close to my heart. Yet O’Neill’s seductive mixture of historical fact, redemptive philosophy and wildly imaginative fiction have reeled me in every time and made me a willing convert to his interests. [His] forte is to take real people in their real eras and place and invest them with thoughts, motivations and, at times, the most rambustious adventures, which all eventually culminate in a low-key but powerful thought-provoking message for the modern reader. [With The Empire of Eternity] one is surprised and delighted, yet again, by O’Neill’s numinous, adventurous approach to our flawed humanity. [A] cleverly constructed historical thriller. O’Neill’s style – urbane, informed and wryly amused – is his own. He has a good ear for dialogue and convincingly evokes the idiom of the age. [He] maintains suspense by deferring the solution to the last possible moment. These closing sequences, in which time, memory and narrative converge, are utterly enthralling.